Cabbage comes in many forms and colors: white, green, red, round, flat, pointed, savoyed, Chinese, etc. Cabbage can be grown nearly year-round; delicately textured early spring cabbages, sweet and tasty pointed cabbages, bolder summer cabbages, and hardy winter cabbage. Early Spring types are juicy and tender; best used for fresh salads. Varieties include Farao F1, Katarina F1 (AAS Winner), Derby Day, Quick Start F1. Summer/Round types are thicker and harder; best used for coleslaw, salads, and cooking. Varieties include Fast Vantage F1, Golden Acre, Stonehead F1, Capture F1. Summer/Pointed types are soft and tender; best used for fresh salads or grilled. Varieties include Caraflex F1, Murdoc F1, Early Jersey Wakefield. Summer/Savoy types are crinkled and light; best used for stir-fries, steamed or in soups. Varieties include Savoy Perfection, Alcosa F1, Melissa F1. Winter /Storage types are thicker and firmer; best used for coleslaw, soups, and stews. Storage types can be kept in the refrigerator or root cellar for long periods of time and eaten during the winter months. Varieties include Danish Ball Head, Reaction F1, Kaitlin F1, Brunswick. Chinese/Napa are barrel shaped and either green or yellow on the inside and usually have a green exterior. They are best eaten raw or lightly cooked. Varieties include China Express F1, Michihli, Bilko F1. 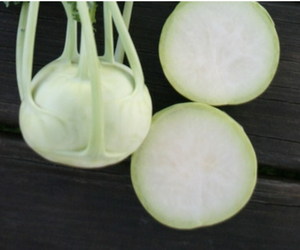 Pak Choi, aka Bok Choi is closely related to the Chinese/Napa cabbage but has a very different appearance. The stems are thick and juicy and grow upright like celery. Both the stem and leaves can be chopped for use in stir fry or salads. Baby varieties can be split and grilled or quickly broiled for a beautiful side dish. From above the plants resemble flowers. Shanghai types have green stems and leaves. Canton types have bright white stems and green leaves. Bothe types come in baby and adult varieties. Varieties include Bopak F1 (AAS Winner), Joi Choi F1 (large Canton), Toy Choy F1 (baby Canton), Petite Star F1 (baby Shanghai) Mei Qing Choi F1 (can be used as baby or large size). White types are most often self-blanching- meaning inner leaves cover the curds and protect them from the sun. Varieties include Flamenco F1 (summer production), Toledo F1 (fall production), Snowball, Snowbowl F1, Symphony F1. Romanesco types are a special type of green cauliflower. The head is a collection of spiraled florets and will be a great way to teach your kids about the Fibonacci numbers (math during dinner!). Romanesco is great for roasting – it is a bit drier than regular cauliflower. Varieties include Veronica F1, Romanesco. Broccoli likes rich soil which includes nitrogen and calcium. Broccoli prefers cool weather so plant in early spring or late summer for a fall harvest. It can also be planted in fall to overwinter in areas with mild winter weather. Varieties include Imperial F1, Waltham 29, Castle Dome F1, Gypsy F1, Green Comet (AAS Winner), Premium Crop (AAS Winner). Baby broccoli seed has become available to home gardeners in recent years. Pinch the main head out when it is the size of a nickel so that your plant sends out the tender stemmed side shoots. Regular harvesting will increase yield. Varieties include Artwork F1 (AAS Winner), and Aspabroc F1. Broccoli Raab is an heirloom type, harvested when florets are very small and tender. Like baby broccoli, regular harvesting will increase overall all yield. Broccoli raab matures quickly so keep an eye on it. Varieties include Rapini, Zamboni, and Sessantina Grossa. Brussels sprouts are best planted in the late summer for a fall harvest or can overwinter in mild areas. Varieties include Diablo F1 (cold tolerant), Hestia F1 (AAS Winner, early), Jade Cross (AAS Winner), Long Island Improved, Royal Marvel F1. Vates and Georgia types have smooth, medium green leaves (best for wraps), and upright plants that regrow quickly. Look to hybrids for improved yield (less stem, fastest regrowth) and bolt tolerance. Varieties include Vates, Georgia, Bulldog F1, and Flash. Champion types have a slightly savory/waxy leaf (best for chips). They are often a darker green or dark blue green. The plants are smaller and more cold tolerant than the other types. Look to hybrids for higher yield, quicker maturity, and improved bolt tolerance. Varieties include Champion, Top Bunch F1, Tiger F1. Yes, America is eating more Kale! Kale made it to the top of the ANDI list (Aggregate Nutrient Density Index), and now you can find kale everywhere. Kale is just about the easiest to grow of all the Brassicas and can be harvested continuously by just harvesting the lower leaves while the top leaves keep growing. Kale is easy to cook with and becomes tender if you chop it, knead it with a little oil and vinegar and marinade for a few minutes before serving. Curly-leaf types have better cold and frost tolerance, a bit of frost will tenderize the leaves and make them sweeter. You can also put your kale in the freezer overnight to get the same effect. Varieties include Prizm F1 (compact AAS winner), Blue Ridge F1, Starbor F1, and Vates Blue Curled Scotch. Lacinato/Dinosaur types have deep blue-green, sword-shaped leaves and are mild tasting in the summer and fall and yet are very cold tolerant as well. They are a key ingredient in many Italian soups and make great chips. Varieties include Toscano, Black Magic, and Lacinato. Russian types are mild in the summer and also cold tolerant. They can overwinter in mild areas. Varieties include Improved Dwarf Siberian, Siberian, White Russian, and Red Russian. And don’t forget about Tronchuda or Portuguese types, the crucial ingredient in Portuguese Kale Soup (Caldo Verde). Varieties include Beria F1, Tronchuda. Standard types are best harvested at baseball size or smaller. Varieties include Quickstar F1(very early), Konan F1 (AAS Winner, crisp, juicy and sweet), Purple Vienna and Kolibri F1 have purple skin (white flesh). Red Round Types grow quickly and make a great first vegetable for kids to grow. Plant when cool and water evenly for mild flavored roots. Heat and stress cause early bolting. Hybrids are more uniform in size and maturity. Varieties include Cherry Belle (AAS Winner), Cheriette F1, Champion, Sparkler, Rivoli (AAS Winner), Roxanne F1 (AAS Winner). Novelty types come in many shapes and colors. French breakfast is nice sliced thin and served with sea salt on tiny buttered toasts. Watermelon types mature a little later but are worth the wait! They should be sliced with a mandolin and served on salads. Daikon is used for pickles and stores well. Easter Egg types are brightly colored and fun for kids. Varieties include French Breakfast, Patricia, Easter Egg, Starburst, Red Meat, Alpine, Sweet Baby F1 (AAS Winner). Rutabagas are a cross between a turnip and a wild cabbage. They trace back to the middle ages and were used in cattle fodder and only eaten in times of hardship. They require cold conditions before harvest for maximum sweetness and store well. Most varieties have roots with a purple top and creamy white/yellow bottom. Varieties include Laurentian, Helenor, and American Purple Top. The Turnip loves poor soil and store well making it the perfect garden plant. Some types are grown for the tops, which are often stewed like collards, while other types are used only for the root. A few particularly useful types have edible roots and stems. Before pumpkins became popular for Halloween décor, turnips were carved and carried as lanterns on sticks or used as fall decoration in the UK. Varieties include Purple Top White Globe (just for roots), Tokyo Cross (AAS Winner, tender top white root), White Lady F1 (tender top, white root), and Topper F1 (just for tops). 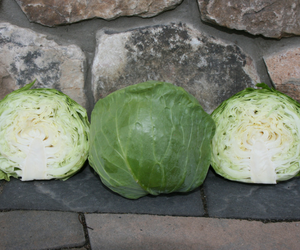 AAS Winner Katarina Cabbage, a smaller head size (4”) and shape, grow successfully in containers or garden beds. Harvest from seeds in 55 days! Harvest from seed in 50 days, this AAS Winner Konan Kohlrabi can be planted now in containers or garden beds and enjoyed this fall! 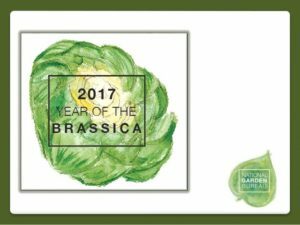 Download the Year of the Brassica presentation on SlideShare.